0 Comments Published by daveterry on Saturday, January 7, 2012 at 10:17 PM. 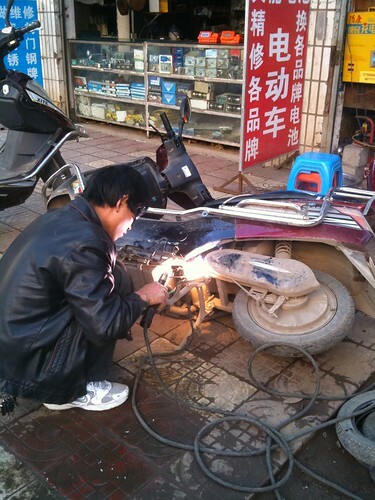 You'll never see this in America, a guy welding out on a busy thoroughfare. In fact, I believe that the sidewalks were built to cause injury. Uneven and broken tiles pieced together without cement rock when you step on them. Even special yellow tiles installed for blind people are more treacherous than just walking in the street. The tiles are slick, especially when wet. Spill some oil on them and there is no way to walk down the sidewalk without doing a face plant. It's insanity. Anyway, were was I? Oh yeah, a friend and I went down to the local moped repairman, who sits in an open roll up doorway. We explain that the kickstand doesn't support the bike correctly and my key ignition is spinning freely and needs replacing. On the spot, within 30 minutes, he welded stops on the kickstand (he just used bolts he had laying around in a bin), and replaced all four key locks on my moped. If I needed these repairs done in the States it would take a week and cost a fortune. But here in China, it was done while we waited and it cost us just $7, labor and parts included. Amazing. When we arrived in China back in April I bought my moped at the second hand market. I just went down to the market, gave the guy 272 bucks and drove off. No license, no tax, no registration. Easy. But theft of the bikes is high. So to crack down on this the government has instituted a new program: all mopeds must be registered by January 1st. This is a crazy process, especially for foreigners. The paperwork required: original purchase receipt, moped ID card, passport, VISA, local police office registration, proof of residency, etc. is a pain and complex. In addition, the form I had to fill out after handing over all this stuff was in Chinese. What's worse, my passport is in English (duh, it's from America!) so the guy typing all the information into the computer couldn't read it. I stepped around the barricade and helped him get the information into his computer. Eventually after two hours I had my license plate, personal ID card, and stamped numbers on my bike frame. Yet, while riding down the road the other day, a cop flagged me down. Said that we are not allowed to have two people on the moped. Of course, everyone rides with two people on their electric bikes. I didn't argue. Ruth got off, I paid the $3 fee, and drove off. Ruth had to walk the rest of the way.